All we needed to move in, with room to spare in my hatchback. the requisite rubber ducky wearing sunglasses and a lakeside view. Not a bad spot to crash while apartment-hunting. In the interim, we are incredibly grateful to Wayne's friend, Kevin Fogg, who consistently kept his eye out for a job for Wayne, and eventually placed his resume in the hands of a hiring manager ready to hire him. Kevin and his wife Barbara graciously let us crash at their place for the week it took for us to find a place of our own. Kevin also gave us a spin around town and ferried Wayne into work several times while I apartment hunted*. *Apartment-hunting in the bustling Space Coast is not a task for the faint of heart. Watch for a separate post on that topic soon! As well as the continuation of our budget road trip lessons,highlights and Space Coast oddities. Our airbed. It ain't much, but it does the job, for now. Meanwhile, after combing all (and I do mean all!) the thrift shops in Melbourne and Palm Bay, we have acquired a few more items (still all from Habitat ReStore). Thus far, all transported via my miniscule hatchback! in Jacksonville in 2014 on the condition it would never come back to them. 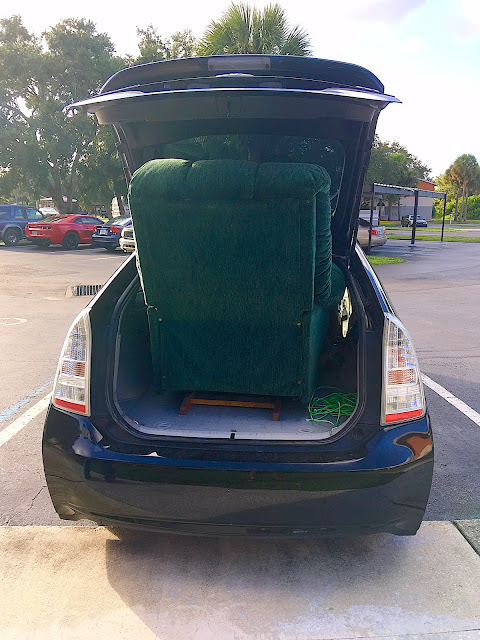 Hardly the optimal transport vehicle for a recliner, but my trusty Prius did the deed! Home doesn't feel like home until we have a mattress pad and a couch, though Wayne's $15 recliner will get us by in the meantime. Thanks to the new-to-us recliner, now Goldie doesn't need to give up her spot. Wifi is scheduled for installation Thursday... kind of running out excuses for not getting these posts done!